Creative Sourcing: Our Tax Dollars at Work! Librarians and government databases are a great source of information. Our client needed to know chemical plants of a certain production power and NAICS code in a certain location. ReferenceUSA and Hoovers not cutting it? Try the EPA! 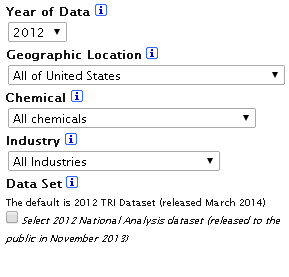 A search on an EPA database which records chemical emissions can deliver location, industry, size of plant by emissions released – as well as names and contact numbers. Don’t forget Uncle Sam! Impossible Search? Or Are You Skipping a Strategic Step?? How do you source for your most challenging positions-to-fill? Are you presenting the most qualified talent or the most available talent? We’ve all recruited for tough-to-fill openings, hard-to-please hiring managers, less-than-competitive salaries, and even not-so-favorable company press. But what if you’re recruiting for a position and you simply can’t find the qualified talent? The list of must-haves is long, you’ve searched your ATS and external resume databases, posted your jobs on the most compelling sites, and utilized all of the latest social networking tools, but the quality of the candidate pipeline is still lacking. You may be surprised to know that for any given search, as much as 32 to 83% of the professional working population in the US is UN-identifiable online. What do you do when the talent you seek is choosing to keep a low profile? Can you risk not considering what might be the best possible talent for your challenging need? It’s amazing what’s available for the asking. Polite, professional and persistent identification is the tack we take to successfully obtain the information we need by phone. The lost art of telephone research has been called “audacious” and rightly so. Other deserving describers might be courageous, creative, enterprising, tenacious and undaunted. Wouldn’t you like to see these adjectives on your next performance evaluation? Investigative, evidence-gathering, questioning skills, the what-you-say and what-you-don’t say over the phone, can raise the quality of talent you identify and place, and build your reputation as Deliverer of Results. These strategic pipelining skills have propelled many search professionals, corporate recruiting and sourcing individuals to excel in the most challenging of recruiting projects, and this identification technique is effective in all industries, all functions, at all levels, worldwide. Original telephone research, the techniques outlined in Search/Research Success™ by ExecuQuest: Learning the Art of Quality-First Talent Sourcing and The Seven Habits of Successful Sourcers™ deliver the added ROI your company seeks. Telephone research is real-time, primary research while what we find online is secondary research. The information we gather from calling into a company simply cannot be found online. The key to succeeding in recruiting is learning how to increase candidate quality, creating talent-rich pipelines and maximizing competitive intelligence while spending minimal time managing information overload. Supplementing internet findings with original telephone research elevates candidate quality and empowers the proactive pipelining we all seek. Total Hours for Identification: 40 hours for 2 placements thus far, with additional hires to be made at no additional cost. Note: 58% of the on-target names were not identifiable on LinkedIn nor via appropriate keyword search strings. For a leading international bank. Total Hours for Identification and Candidate Development: 133.15 hours for 2 placements thus far with additional placements to be made at no additional cost. 43% of the on-target names were not identifiable on LinkedIn nor via appropriate keyword search strings. © 2014 ExecuQuest Inc. All Rights Reserved.